There are many types of heel pain treatment. Some are geared for symptomatic relief only, while others are corrective or curative. Some are oral and some are surgical. We’ll discuss the various types of treatment and how they can affect the way you move about. Think of heel pain treatment as rungs in a ladder, with the lowest rungs representing the easiest, non-invasive options. The more chronic and severe the pain and disability of plantar fasciitis and heel spurs is, the higher up the ladder of treatment you need to ascend. Let’s start with the easiest of the options. If your symptoms are relatively mild and recent, perhaps all you may need in the way of treatment may be oral pain medications, anti-inflammatory drugs,or NSAIDs, better shoes, activity modification and possible arch support pads. This may include over-the-counter pain relievers such as Aleve, Tylenol or Advil. Because symptoms can come on gradually, the initial pain may be mild and infrequent. As the internal inflammation continues to progress and worsen, stronger medication may be necessary, such as Tylenol#3 with codeine, Vicodin, and Percocet to name just a few. At this point, it may be necessary to use padded in-soles or arch pads to lessen the direct pressure on the bottom of the heel. Really, for heel pain treatment at any level, you should be using some kind of supportive padding to lessen the direct pressure, and ultimate irritation, on the bottom of the heel. There are dozens of pads and manufacturers available. Many can be purchased over the counter and at department stores in the shoe or “Dr. Scholl’s” section. Many of the better quality supports and pads are made from materials that are soft, yet durable and functional. 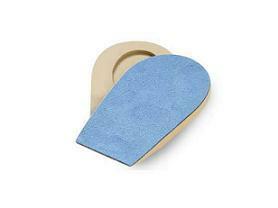 One brand name is HaPad arch supports and orthotics. 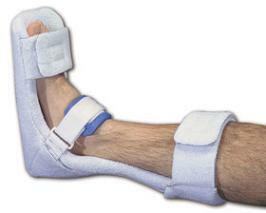 These are quite popular among medical practices and orthotic shops. Frequently, supports and pads are prescription related, and may well be covered under your health insurance, so check it out before spending money. When oral medications are no longer effective, or if symptoms worsen, one of the next higher “rungs in the ladder” of options in heel pain treatment may be injections, particularly steroid injections. There are many different types and strengths of steroids that are used to treat plantar fasciitis and heel spur pain. Some are short acting, while others linger a bit longer. The use of injections can eliminate symptoms for a very long time, at times permanently. One of the drawbacks of the injections is that they are not pleasant top undergo. 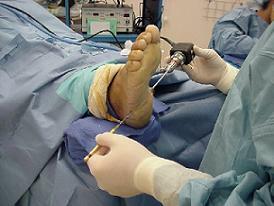 Injection sites are typically located on either the side of the heel, or on the bottom of it. Either way, they are no fun to get, but most people say that the short term discomfort of the injection is nothing compared to the relief they get from them, and gladly endure the needle. Night splints are special splints which are fabricated for the purpose of stretching the plantar fascia throughout the night while you sleep. By stretching the fascia, it lessens the pain when you arise in the morning and take those first few steps. By keeping the fascia stretched, it lessens the trauma to it and ultimate pain and inflammation. There are dozens of different styles and brands of night splints, and some may even be over-the-counter. For the most part, they usually require a prescription, especially important if you have insurance coverage for durable medical equipment (DME), to be discussed later). Extra-Corporeal (outside of the body) Shock Wave Lithotripsy, or ESWL for short, refers to the technology of applying sonic (sound) waves to a body part with sufficient force as to destroy tissue or substances. Initially, this technology and the procedures that go with it, was developed for the treatment of kidney stones, so that the stones could literally be “crushed” while still in the body and not require as large painful surgical procedure to remove them. Since then, ESWL has been adapted for use on such orthopedic conditions as elbow tendinitis (tennis elbow) and plantar fasciitis / heel spurs and has become a legitimate option for heel pain treatment. Traditionally, the most common surgical approach used in heel pain treatment of plantar fasciitis, with or without painful spurs, was to openly excise or remove the spur(s) and partially (if not fully) release the band of plantar fascia at the point of maximum involvement. This can be uncomfortable surgery as it involves an incision and can negatively affect mobility and weight bearing for several weeks. Not so much anymore. A newer surgical technique that is being employed by more and more foot specialists is the endoscopic surgical approach for heel pain treatment. Similar to the endoscopic techniques used for gallbladder removal, laparoscopic hysterectomies etc. 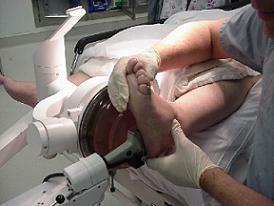 this technique involves two main entry stab wounds, one on either side of the heel where a small fiber-optic scope and camera are inserted to visualize the plantar fascia and calcaneus (heel bone) attachment. The other portal is used for introducing tiny instruments to perform the fascia release and possibly grind or shave the edges of the spur down. This surgical approach is far less invasive and ultimately less painful.